“In his court filing, Salvati claims he and his friends encountered several police officers on the evening of June 23 and were intrigued by the robust security in downtown Toronto, stopping several times to chat and even take pictures with officers. “At the end of the night, while trying to hail a cab, Salvati said he encountered two female RCMP officers and tried to engage them in conversation, too. He said the officers ignored him, prompting Salvati to say they should be more polite because taxpayers are paying for their overtime. “The filing states Salvati hailed a cab to go to a friend’s house. At a red light, two police officers approached the taxi and pulled him out. 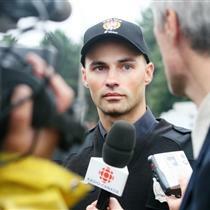 Desjourdy was charged with Sexual Assault by Ontario’s Special Investigations Unit. On top of criminal charges, Desjourdy faces a $1.2 million civil suit that Stacy Bonds filed against the Ottawa Police Service. “‘What on earth is going on at the Ottawa Police Service,’ said lawyer Sean Dewart, who is representing Bonds in her $1.2-million lawsuit against the Ottawa Police Service…. “Although police are sometimes charged for incidents that occur while on the job; it’s unusual that a police officer would face a sexual assault charge stemming from an alleged incident that occurred in police headquarters. “‘In my experience, it is rare that Ottawa police officers are charged with these serious types of offenses while they’re in the course of their duties,’ said Ottawa criminal lawyer Cheryl Letourneau. Bonds was arrested for allegedly having an open container of alcohol, which police did not produce into evidence. She was later charged with assaulting a police officer. The judge in her case threw out the charges. Desjourdy is also a named defendent in another lawsuit filed by a woman, Roxanne Carr, who was beaten and left naked in her cell for nine hours. She weighs all of 100 pounds. Criminal charges against her were also dismissed. Special Constable Melanie Morris was also involved in assaulting both Carr and Bonds. Carr is suing for $975,000. “I get the feeling that if the average citizen did to a cop what this cop has done to two [actually, three] women, the law enforcement community probably wouldn’t deem it an important learning experience. Maybe it’s time for some street justice for this out of control thug with a badge. Short of that, maybe justice will be served by this Care2 Petition to get these criminal cops fired.